This isn't a new story, but we don't often find it recounted in a mainstream magazine. During the early 1950s, as Charles M. Schulz was fine-tuning the cast list for his fledgling newspaper comic strip, new characters slowly joined the original quartet of Charlie Brown, Shermy, Patty and Snoopy. Some would go on to become stars, such as Violet, Lucy and Linus; others ... not so much. Charlotte arrived with a booming voice that Charlie Brown claimed was powered by a "built-in hi-fidelity speaker," and this tendency to SPEAK LIKE THIS AT ALL TIMES wore thin rather quickly. "Good ol' Charlotte Braun," as she once dubbed herself, insisted that she merely had a "driving personality (and) definite opinions." These characteristics quickly became embraced by Lucy, as she grew older, leaving Charlotte to the fading mists of antiquity and stump-the-expert quizzes among Peanuts devotees. Her final visit to the neighborhood was on February 1, 1955, a mere two months after she debuted on November 30, 1954. But Charlotte hadn't gone quietly into that good night; indeed, she had been pushed. Although Schulz probably would have eliminated the obnoxious little girl anyway, the catalyst came with a letter from Elizabeth Swaim, a fan who strongly disliked this new character. 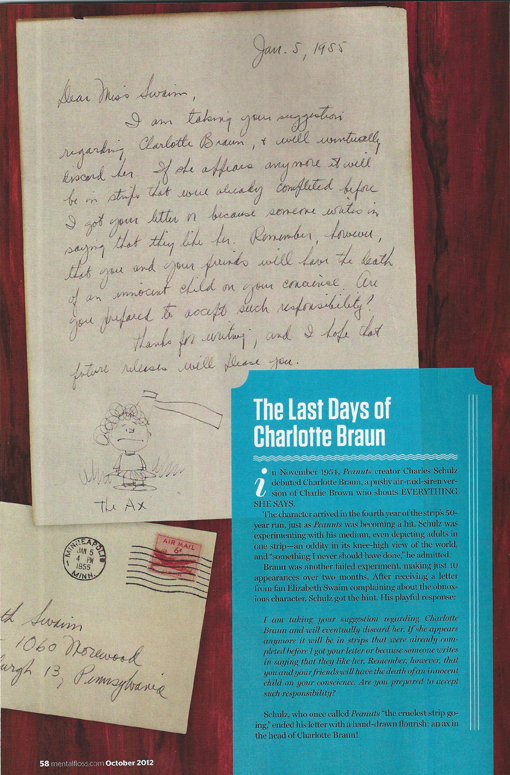 Schulz answered much of his mail in those early days, and his reply promised to remove Charlotte ... while warning that Ms. Swaim would have "the death of an innocent child on [her] conscience." As an added bonus, Schulz included what probably was the last sketch ever done of poor Charlotte ... with an ax buried in her head! Since the other letters are from Annie Oakley, Ian Fleming, Alexander Hamilton and Thomas Wentworth Higginson (Emily Dickinson's publisher), Schulz — and Charlotte — are among rarefied company!